The New Year is underway and with it, there are three new legislative voices in the State Capitol to represent the Greater Danbury area. The three members of the Danbury delegation that remain are: State Representative Bob Godfrey, Democrat, House District 110 – Danbury, first elected in 1989; State Representative Richard Smith, Republican, House District 108 – Danbury, New Fairfield, New Milford, Sherman, first elected in 2011; State Representative David Arconti, Democrat, House District 109 – Danbury, first elected in 2013; and State Representative Steve Harding, Republican, House District 110 – Bethel, Brookfield, Danbury, first elected in 2015. Below are brief bios of Greater Danbury new Senator-Elect Julie Kushner, State Representative-Elect Raghib Allie-Brennan and State Representative-Elect Kenneth Gucker. Senator Julie Kushner started working as a secretary while in college. She quickly realized that she and the women she worked with weren’t paid fairly. In 1980, Julie led a campaign to organize the support staff of Columbia University. Through negotiations, they won significant pay increases, improved healthcare and established childcare benefits. For forty-two years, Julie organized and negotiated on behalf of the United Auto Workers union, winning rights and improving conditions for workers in Connecticut, and throughout the Northeast states and Puerto Rico. 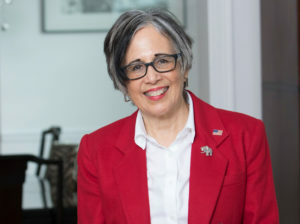 Julie has been active on the Danbury Democratic Town Committee and is a lifetime member of the National Association for the Advancement of Colored People (NAACP) and the Labor Council for Latin American Advancement. As a state senator, she represents the towns of Danbury, New Fairfield, Sherman and part of Bethel. Julie will schedule regular meetings in each town to discuss the issues that matter most to constituents. Her top priority this legislative session is to pass paid family and medical leave — an issue that impacts all of Connecticut’s working families. Julie and her husband, Larry Morgan, have lived in Danbury for 25 years. Their three children, Ole Kushner Hermanson, Raychel Kushner Wishart and Cara Kushner Morgan, attended Danbury Public Schools. She has four grandchildren living in Connecticut, so the future of our state and its residents is very important to Senator Kushner. “I am thrilled with the opportunity to serve and I am always happy to hear from my constituents.” Senator Kushner can be reached via email at Julie.Kushner@cga.ct.gov. In his first term representing Connecticut’s 2nd House District, State Representative-Elect Raghib Allie-Brennan is bringing fresh, new ideas and perspectives to Hartford to support small businesses and fix the budget crisis, advocate for public education and invest in Connecticut’s green energy future. Allie-Brennan was raised in Bethel and has a deep understanding of the district’s needs. His prior role as a congressional advisor in the U.S. House of Representatives allowed him to develop an in-depth understanding of energy and environmental issues, emergency response/disaster relief and civil rights. He has worked across the aisle to gain bipartisan support for legislation, particularly as a lead staffer in efforts to obtain funding for the Low-Income Home Energy Assistance Program (LIHEAP). Allie-Brennan has also testified before the U.S. Commission on Civil Rights regarding environmental justice issues. Locally, Allie-Brennan headed an effort to ban fracking waste in Bethel and garnered bipartisan support for this important effort. Currently, Allie-Brennan serves as vice chair of Bethel’s Democratic Town Committee and as vice president of the HERO Project, which raises awareness and resources to combat the opioid epidemic in the Danbury area. 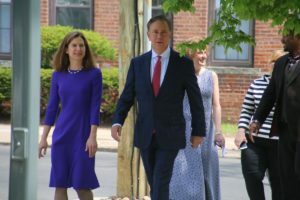 Allie-Brennan is a former board member of the Connecticut League of Conservation Voters and Triangle Community Center. Allie-Brennan graduated from Marymount Manhattan College in 2013 with a B.A. in International Relations and a double minor in history and communications. State Rep. Gucker was unable to reply to our request for a statement in time for the publication of this issue.